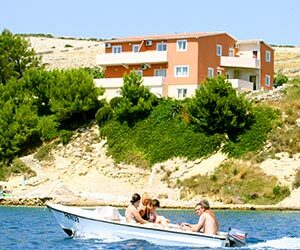 to the Website of our leisure residence SARA in VLASICI on the ISLAND PAG, CROATIA. House Sara is located directly by the see. There are seven large, modern and furnished apartments that can be rented throughout the whole year. Each apartment has air conditioning, TV, a well-equipped kitchen, a terrace with see-view and a parking place. The house offers a private passage to the see as well as the possibility to rent boats. If requested, we offer breakfast or half board. 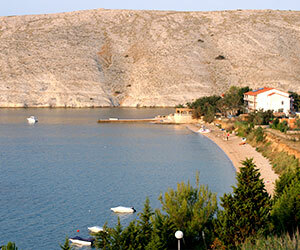 Vlasici is located in a small bay in the southern part of the Northdalmatanian island of Pag. On the sand beach of Vlasici (just a 7 minute walk from the house) you can let your children play in a safe environment. Vlasici is a place where you can revive and regain strength, relax yourself and experience nature. The city of Pag (15 minutes by car) offers many possibilities to go shopping as well as doctors, pharmacies, banks and post offices. The Island of Pag is one of the largest Adriatic islands. With its 270 kilometres of coastline, the Island of Pag does not only have one of the longest coastlines in the Adria, it also has many lagoons and sand beaches. The island supplies a vast variety of beaches: from the big bay, ZRCE (considered as highly recommendable especially by young people) with beach-cafés, boat- and scooter-renting, water sliding, beach ball and discos in the evening with parties until the morning, to remotely located beaches, as well as deserted and lonely bays. Day trips to all beaches and bays on the island are possible. The island is known for its famous handcrafted lace, the delicious lamb meat, cheese and salt, which have been produced there for hundreds of years. Furthermore it is famous for its interesting stone landscape that is said to resemble the surface of the moon.